To be honest, this recipe ended up being kind of a beast. 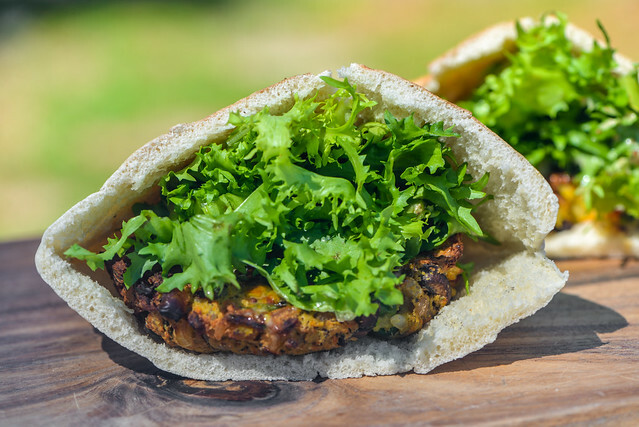 The Sparrow veggie burger was once featured on Diners, Drive-ins, and Dives, so I put it together following what I saw in that segment, plus from a few other folks who tried to make it at home already. 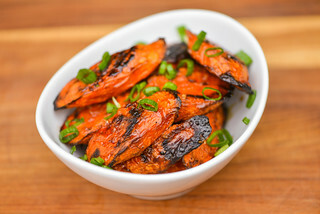 I can see at a restaurant where you have prep cooks and a lot of ingredients on hand, the recipe being manageable, but if you're making it at home, be prepared for a fair amount of prep. That's mainly because it required four cooked ingredients to begin with—barley, brown rice, mashed potatoes, and mushrooms. At least the barley and rice are mostly hands off items—I set those to start cooking before I began the rest of the burger construction. The potatoes weren't too much work either, I just peeled and boiled a pound of russets until they were tender, then drained and smashed. The mushrooms required a bit more attention with their cleaning and then sautéing until well browned. Once all of the cooked ingredients were done and slightly cooled, I put together the entire veggie mixture. This really went all out on the vegetables with carrot, zucchini, corn, peas, scallions, and red pepper. Panko bread crumbs were also used as a binder, and since I was afraid of the burgers not holding their shape on the grill, I also added an eggs to hopefully help them bind together better. Once the veggies were all mixed well by hand, I put the entire bowl in the fridge until it was completely chilled. While waiting for that to happen, I made my version of the sauce the Sparrow serves with their veggie burgers, which is a sweet and spicy mayo. 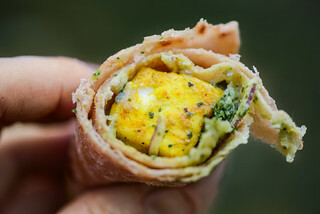 The sweetness comes from maple syrup, while the spicy is a combo of whole grain Dijon and cayenne pepper. I tinkered with the quantities until I got something that tasted well balanced and delicious. After the vegetable mixture was nice and cold, I formed it into patties, with each patty probably being a little under a cup. I forgot to weigh or measure this step, but I tried to make them about the size of the standard 1/3-pound hamburgers I usually make, in case that helps at all. I then put the patties back in the fridge because I had a bunch of other prep to do for the Meatwave that day, but they can go straight to the grill at this point. 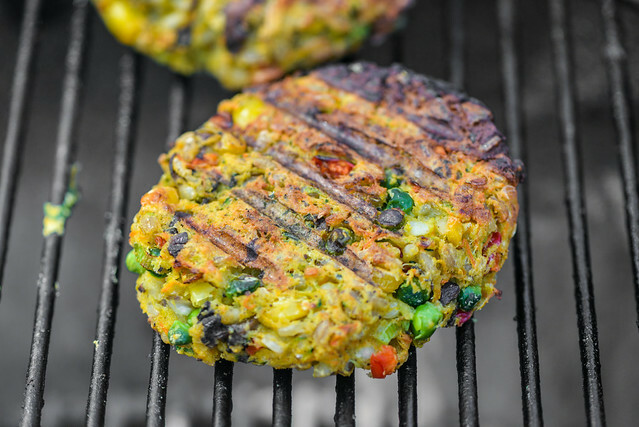 I've actually tried many different veggie burger recipes on the grill in the past and they've all failed. So I went into this hoping for the best, but also expecting the worse. It ended up being a bit of a mixed bag. The Sparrow bakes their burgers before they hit the flat top, so I tried to replicate that on the grill using a two-zone fire, where all the coals are on one side of the charcoal grate, and first roasting the burgers before searing them. That method didn't completely pan out and what ended up happening was the burgers closest to the fire browned well, held together, and were flippable after about 20 to 30 minutes of roasting. The burgers further from the fire feel apart when flipped, albeit in a salvageable way where they could still be served, which I can't say was the case for previous veggie burger attempts. So in the end I had some pretty perfect burgers and then some much less than perfect, but everything could come off the grill and was edible at the end of the day. Sparrow also doesn't do their burger in the standard bun—they serve it in a halved pocket pita and stuffed with frisée, so I followed suit here. I think they actually use whole wheat pita, but I picked up my personal favorite local pita, which happens to be white pita. I then halved each piece and warmed them on the grill until soft and pliable before stuffing with the burgers, sauce, and frisée. The end result was something that was a burger by name only, and that was most definitely a good thing. 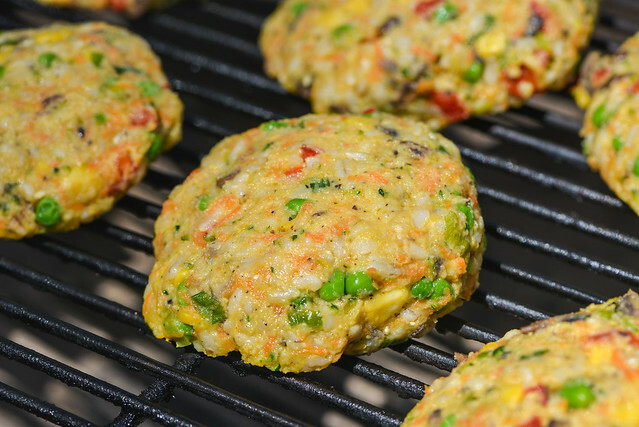 The patties were an incredibly flavorful mixture that tasted like what they were, an amalgam of vegetables with all their sweetness and freshness in tact. At the same time, it was very substantial and totally worthy of the "burger" label by the fact that, after eating one of these, you'll be left pretty stuffed. The sweet and spicy sauce and lightly bitter bite of the frisée were also great compliments to the flavors going on in the patty, while the pita felt like a fitting change of pace from a bun—further reminding you this wasn't trying to be a fake version of what's mostly commonly a beef dish, but something unique and true to its own make-up, which is what makes me personally love this veggie burger more than most. A ton of vegetables go into making this beloved Astoria-born burger, which makes it taste like a the wonderful amalgamation of ingredients it is rather than trying to fool you into thinking it's meat in any way. 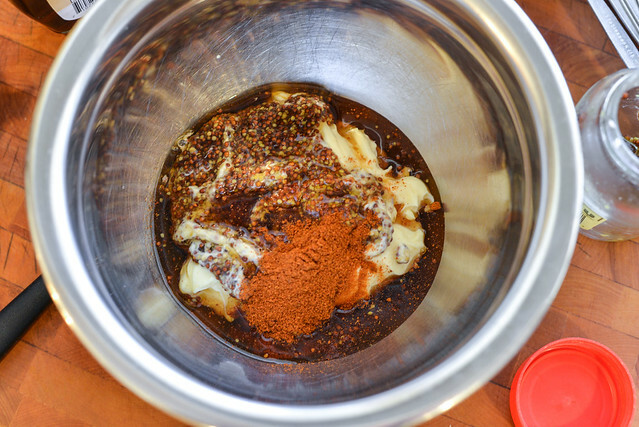 To make the sauce: Place mayo, mustard, maple syrup, and cayenne in a small bowl and whisk to combine. Transfer to an airtight container and place in refrigerator until ready to use. To make the burgers: Place potatoes in a medium saucepan and cover with cold water. Place pan over high heat and bring water to a boil. 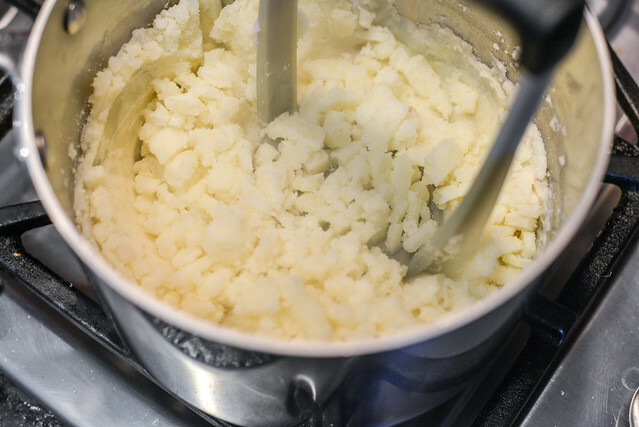 Reduce heat to a simmer and continue to cook until a paring knife goes through center of potato cubes with no resistance, about 20 minutes. Drain potatoes, return to pan, and mash using a potato masher or fork. Set aside. Melt butter in medium pan over medium heat. 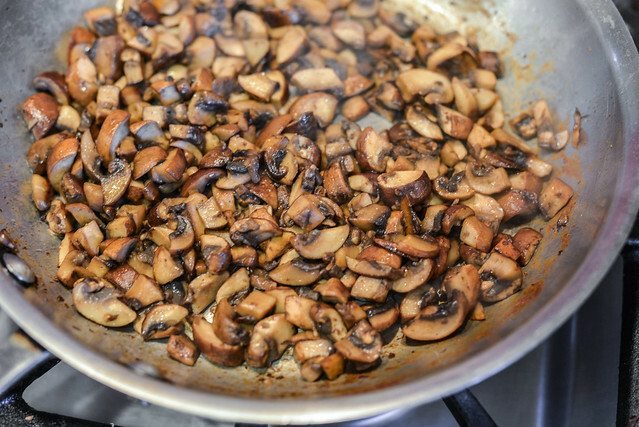 When foaming subsides, add mushrooms and cook, stirring occasionally, until mushrooms release liquid and become well browned, about 10 minutes. Remove from heat and set aside. 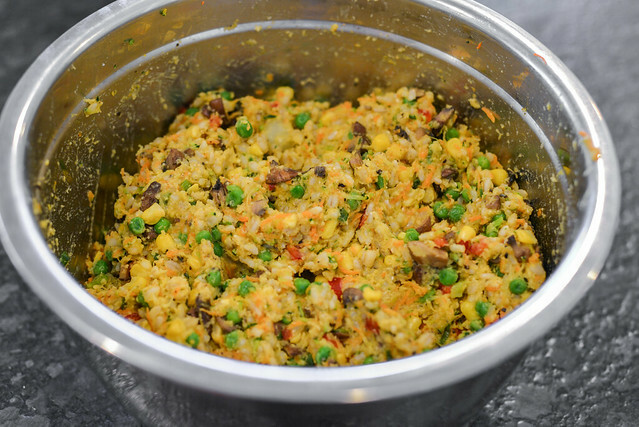 Place mashed potatoes, mushrooms, carrot, zucchini, barley, brown rice, corn, peas, bread crumbs, egg, scallions, bell pepper, salt, and pepper in a large bowl and, using your hands, mix ingredients until well combined. Place bowl in refrigerator for one hour to overnight. Remove bowl from refrigerator. 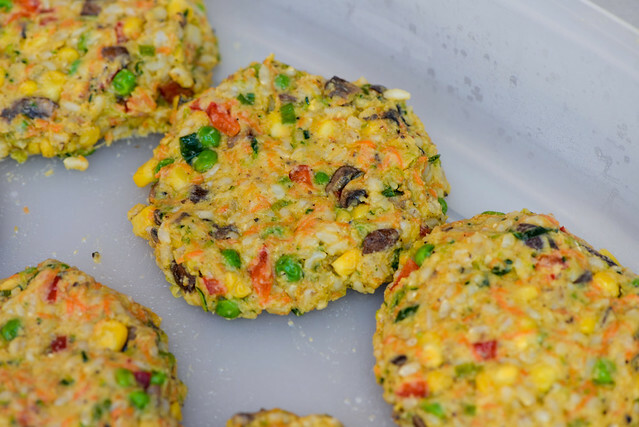 Break off about 1 cup of vegetable mixture and form into a patty. Repeat with remaining vegetable mixture. Light one chimney full of charcoal. 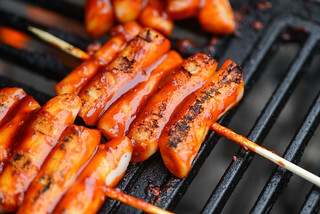 When all the charcoal is lit and covered with gray ash, pour out and arrange the coals on one side of the charcoal grate. Set cooking grate in place, cover grill and allow to preheat for 5 minutes. Clean and oil the grilling grate. Place burgers near, but not directly over, the fire. Cover grill and cook until lightly browned, about 20 minutes. Flip burgers and continue to grill until well browned, about 10 minutes more. 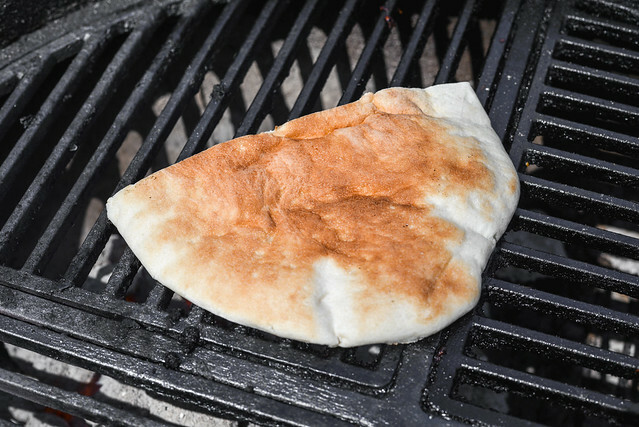 Place pita halves on hot side of grill and cook until warm and pliable, about 30 seconds. 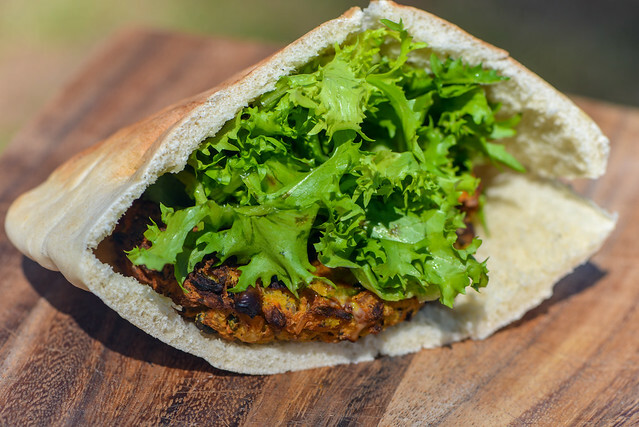 Remove from grill and place cooked 1 patty in each pita, top with sauce, and stuff generously with frisée. Serve immediately. Repeat cooking processing with remaining burgers, adding freshly lit coals to the fire before each new batch.